Halloween is over, it’s Bonfire Night on Monday, and after that the official countdown to Christmas can begin at last (my unofficial countdown started after my birthday in April). Bonfire Night is such an odd celebration – hurrah for a failed terrorist attack! I suppose it’s just that the modern outlook on these things is rather different and things have changed a lot since the days of Guy Fawkes: there are so many thwarted terrorist attacks these days that to celebrate all of them would clog up the calendar a bit. Happy Shoebomber Day, anyone? But maybe the police and intelligence services would appreciate the celebration of their efforts, and perhaps it would deter rather than antagonise any would-be-terrorists out there: get it wrong and you’ll become a quaint British celebration. 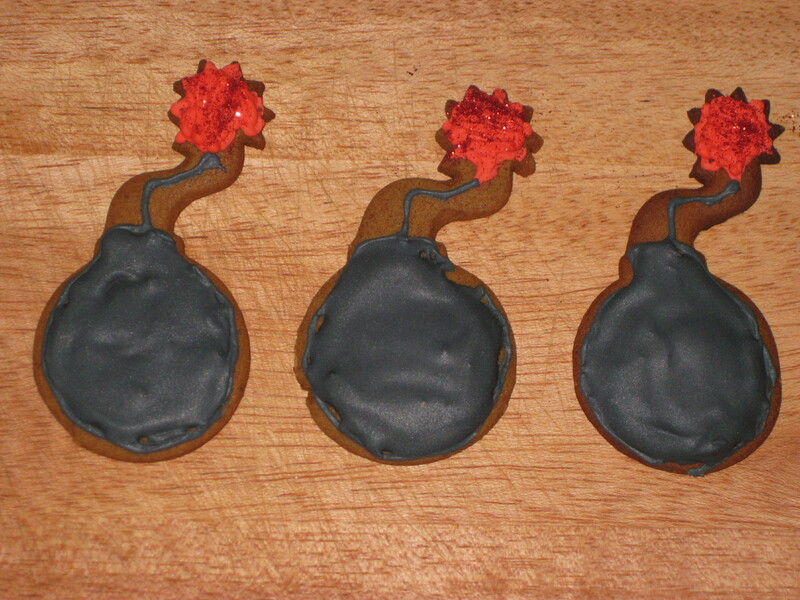 Anyway, in honour of this historic failed terrorist attack, here are some gingerbread bombs. 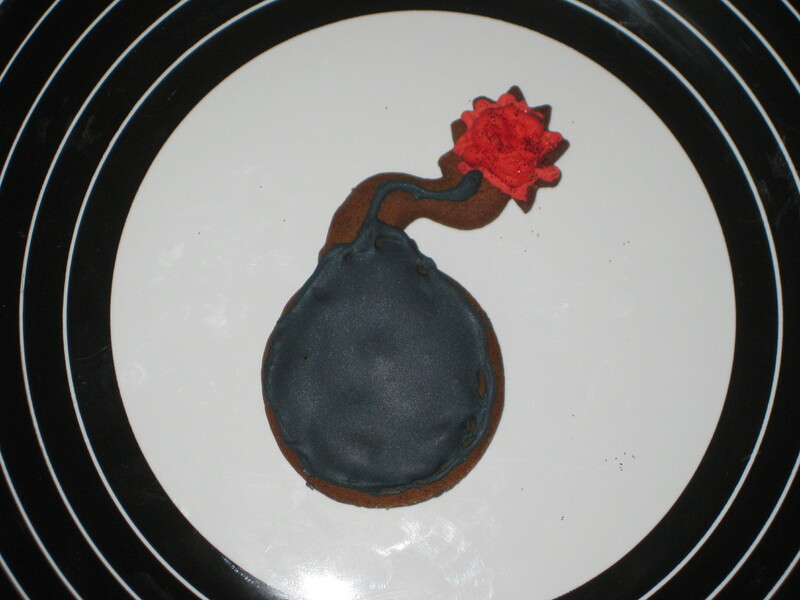 I saw this bomb-shaped cutter in Tokyo and instantly imagined these 5th November treats. 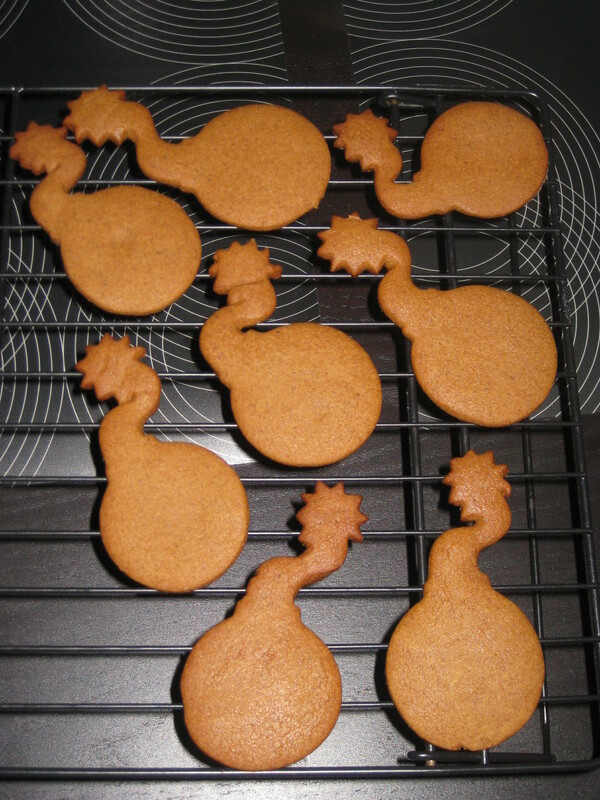 I used a Peggy Porschen recipe for the gingerbread, but misread the 3 tablepsoons of ginger and cinnamon as teaspoons – they were absolutely beautifully spiced, I felt, and I fear 3 tablespoons would be overkill, but feel free to experiment. The biscuits were rock hard at first, but when covered with royal icing they became gorgeously soft and extremely easy to eat one after another. 1. 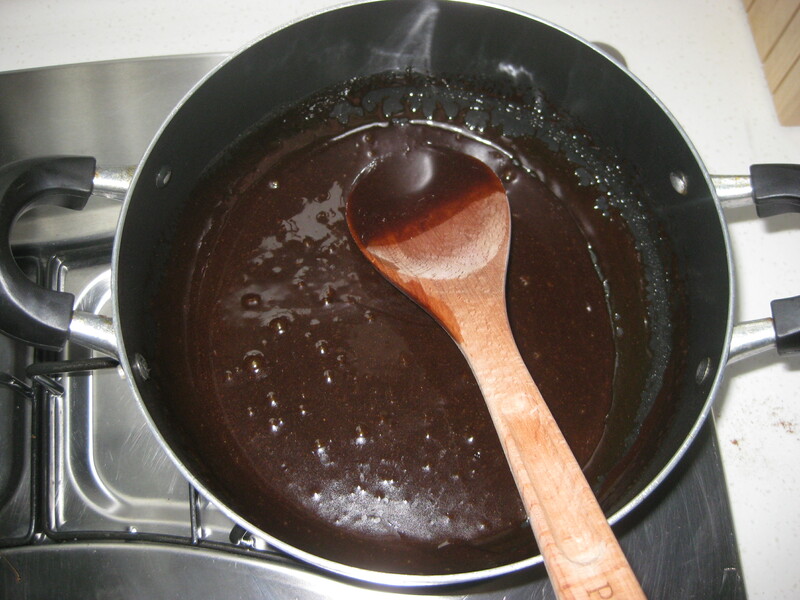 Place the water, sugar, treacle, syrup and spices in a large pan and bring to the boil over a medium heat, stirring constantly. 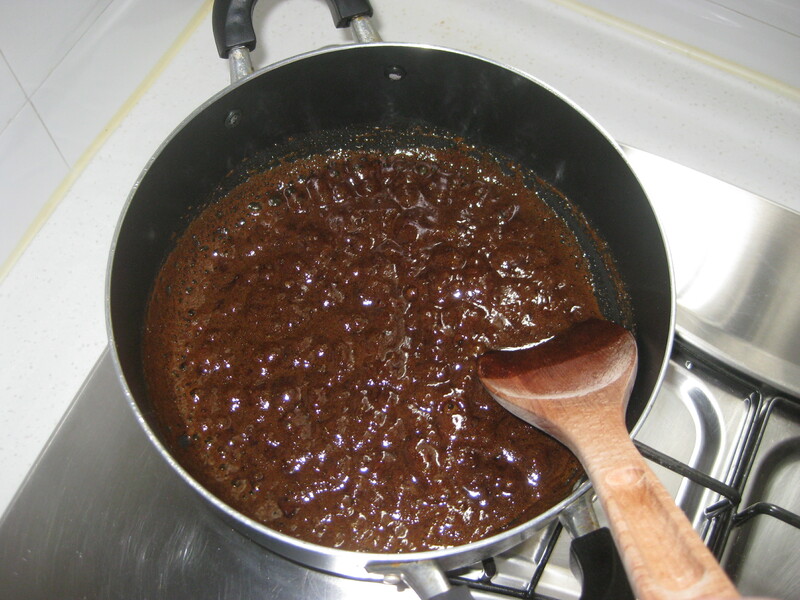 When it boils, remove the pan from the heat. 2. 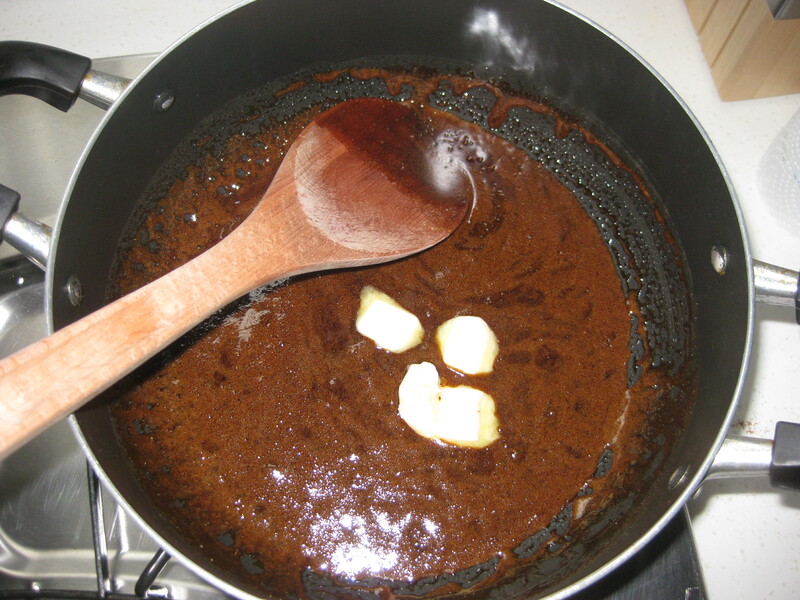 Add the butter a few cubes at a time, mixing well until the mixture thickens into a lovely, spicy gloop. 3. 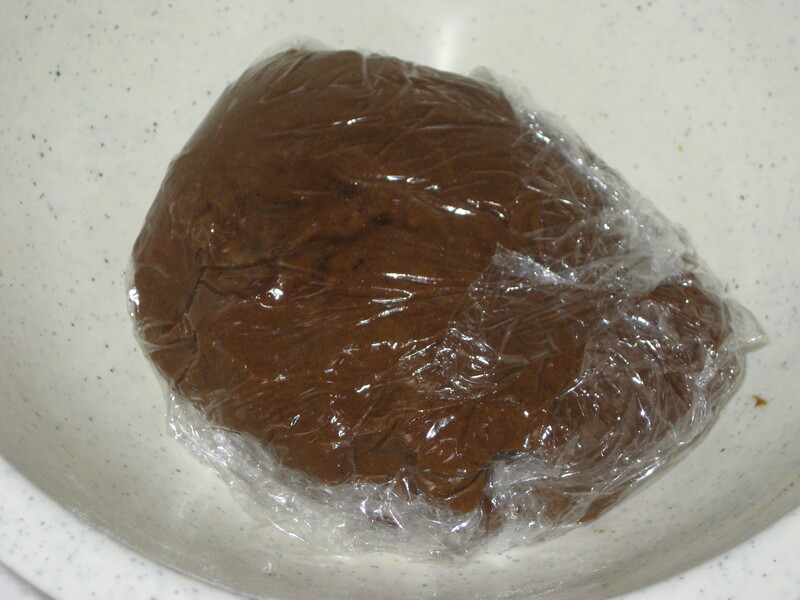 Add the bicarb – it should swell up at this point, but mine didn’t and still turned out successfully. 4. 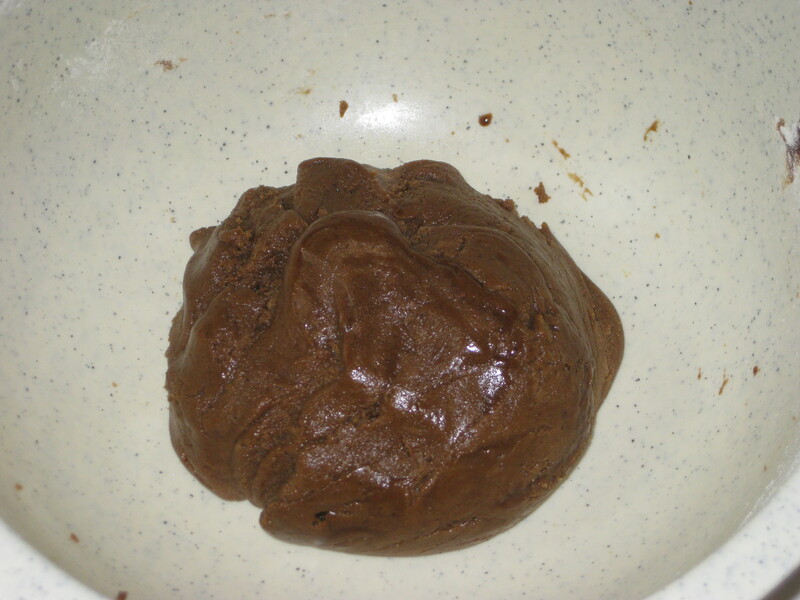 Let it cool slightly, then transfer to a mixing bowl. 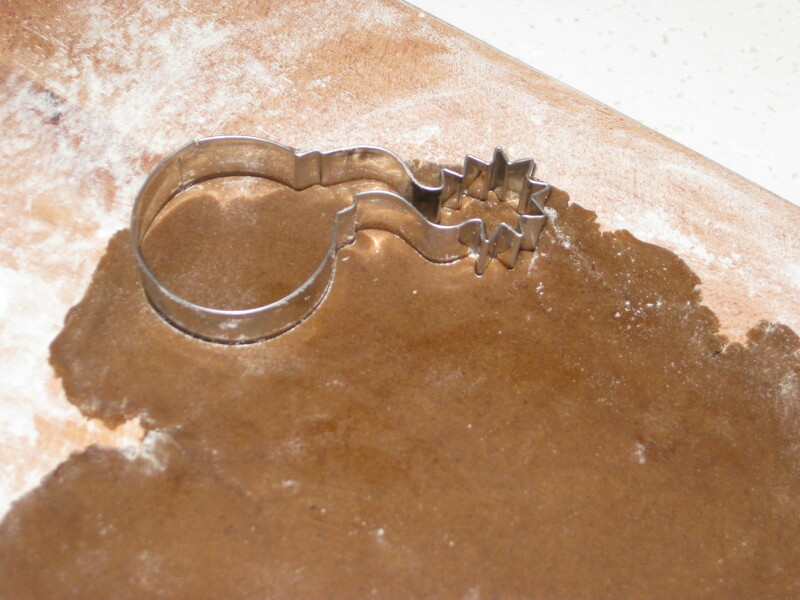 Sift in the flour and beat well to form a still-slightly-sticky dough. 5. Wrap it in clingfilm and chill it for at least 2 hours. Line 2 baking trays with greaseproof paper. 6. On a lightly floured surface, roll out the dough to about 6mm deep (I divided my dough into 3 batches). Stamp out shapes. 7. 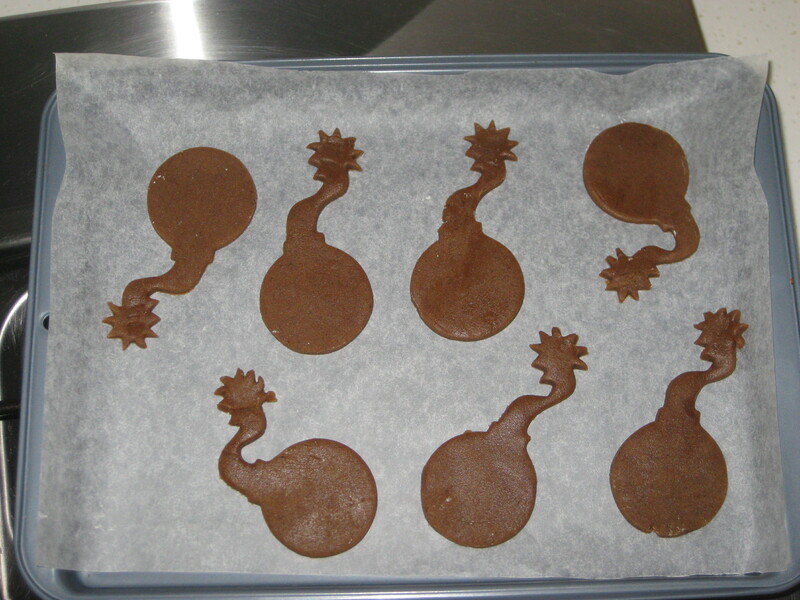 Carefully transfer the shapes to the prepared baking trays and chill for 30 minutes before baking. Preheat the oven to 200C. 8. Bake the biscuits for 6-10 minutes, depending on size. 9. Stand on trays for about 10 minutes, then transfer to wire racks to cool. 10. 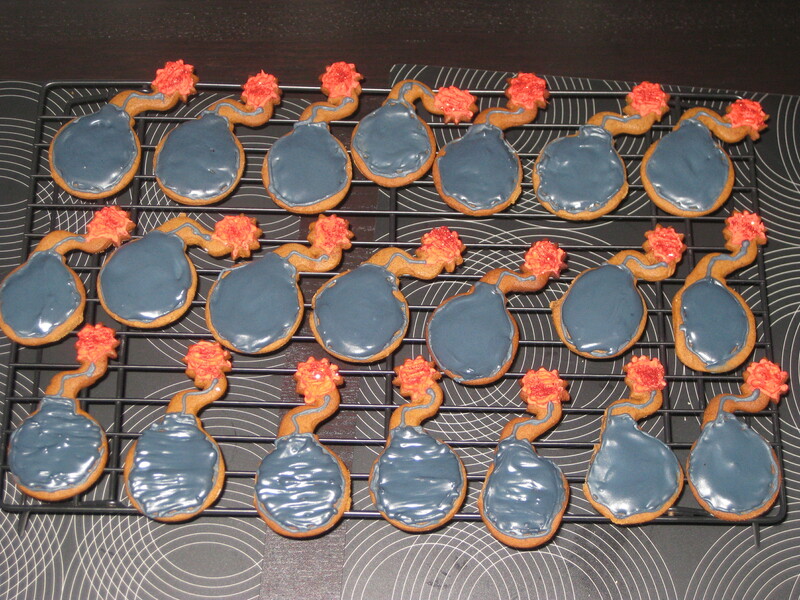 When the biscuits have completely cooled, ice them as you wish. 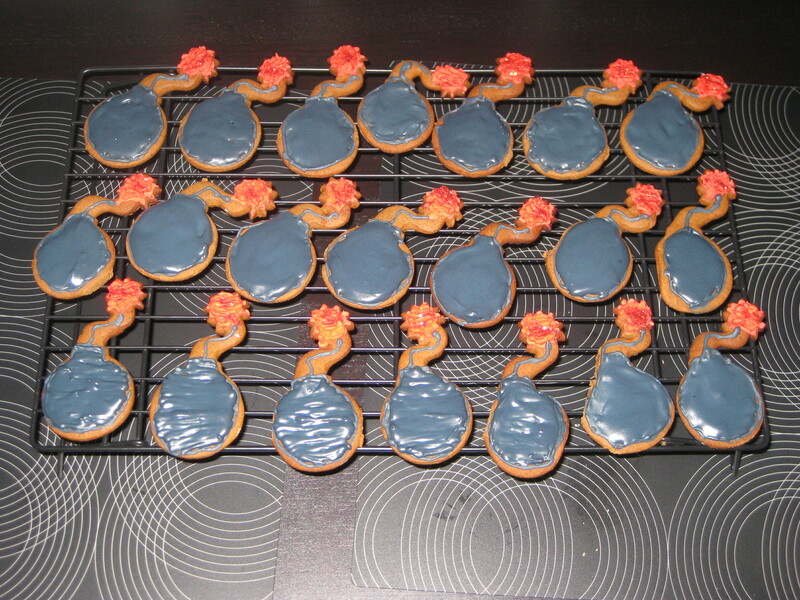 This entry was posted in Vegan Recipes and tagged Bonfire Night baking, gingerbread, gingerbread biscuits. Bookmark the permalink.